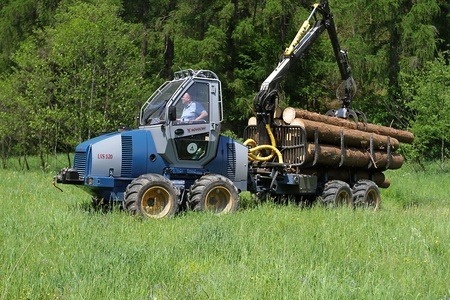 Forwarder for the use in the forestry Novotný LVS 520 is designed mainly for thinning. 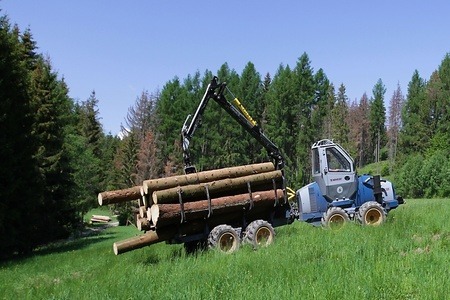 Low impact on forest ground and standing trees, comfort for operators, low operating costs and high productivity of machine played an important role during construction of forwarder LVS 520. Massive 8 wheeled chassis together with 500 mm tires guarantee high stability and good traction even in the most difficult forest terrains. Spacious, safety and air-conditioned cabin can rotate some 180° degrees, this together with easy machine operating, colored electronic display and unique view to the working space provide high comfort for operator. Great chassis, Cummins engine with 60 kW output, Sauer Danfoss hydraulic components, SCAD control system from Adcis and Cranab crane FC 45 classify forwarder Novotný LVS 520 to the highest rating in its class.